Jordan Reeves, 13, was born with a left arm that doesn't extend past her elbow. 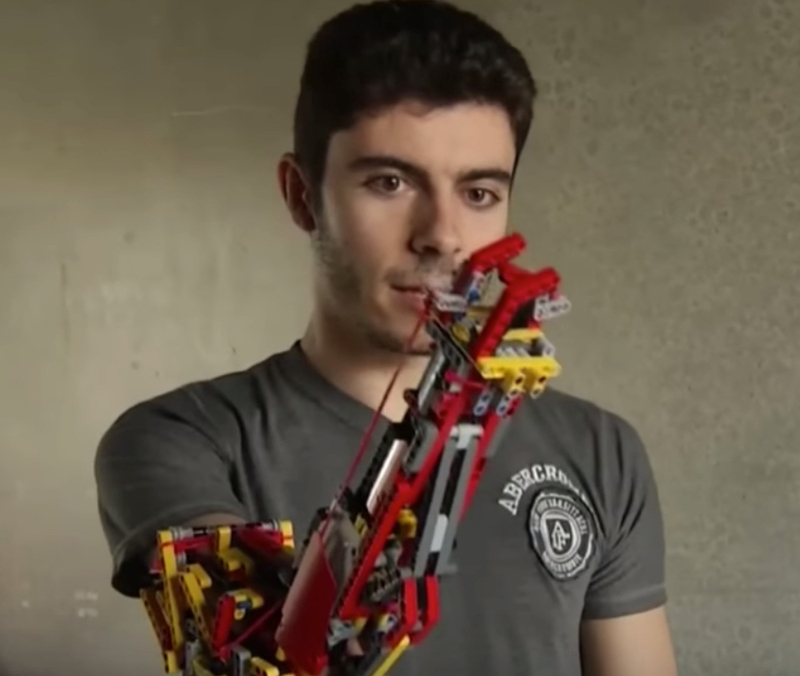 Last year, Jordan dreamt up a curious prosthetic arm that resembles a unicorn horn and shoots glitter out of its tip. Then, working with her prosthetist and technical designers at Autodesk, she designed and built the magical contraption. "I wanted show people that our differences don't necessarily hold us back, in fact, they can give us more opportunity," Reeves told WGN9. 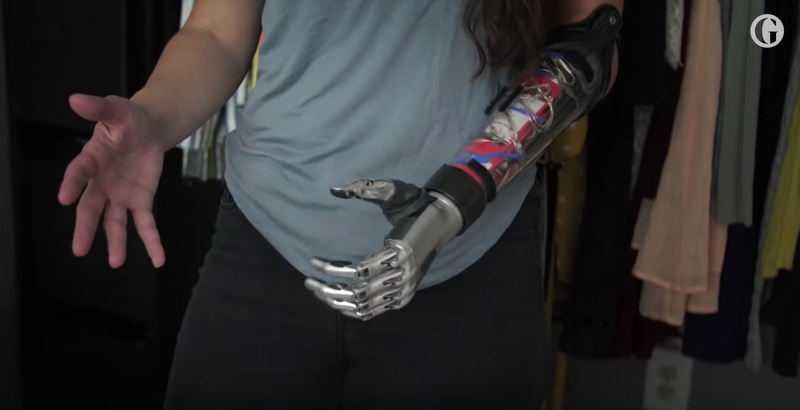 After receiving numerous awards for her ingenuity and founding a nonprofit, Born Just Right, Reeves was invited to display her prosthetic at the Chicago Musuem of Science and Industry's Wired to Wear exhibit. "I love that I can show people that our differences aren't a bad thing... just look at how much fun it can be" Reeves said. 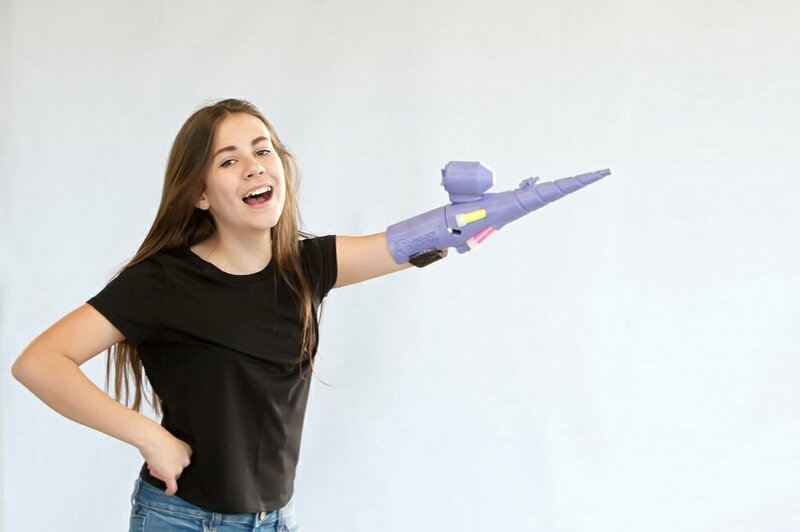 More on Jordan Reeves in Fast Company: "The Girl Behind The Sparkle-Shooting Prosthetic Arm Is Just Getting Started"
The Cyborg Drummer Project Kickstarter is looking to raise $90,000; of that, $70,000 will go straight to production of the new arm. A big chunk of the cost comes from trying to replace the “couple of computers and a technical team” that are currently required to operate the arm with components that are portable, self-contained, and user operated. The remaining $20,000 will go towards organizing concerts and making recordings so that folks who contribute will be able to hear and enjoy some of the result, potentially in person. 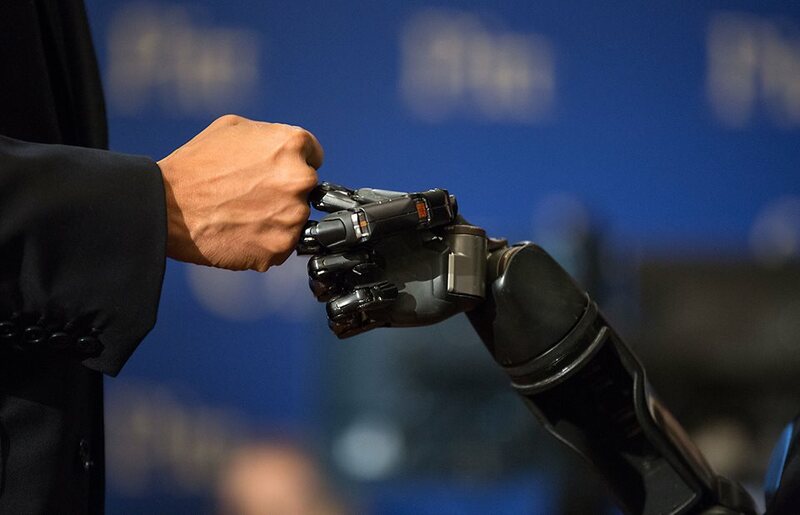 One of the unique things about the prosthetic that Weinberg and Barnes want to build is that it will be partially autonomous. There are two drumsticks: Barnes controls one; the other operates autonomously through its own actuator. The arm listens to the music being played (by Jason and the musicians around him) and improvises its own accompanying beat pattern. It's able to do this on the fly, and if it chooses to, is capable of moving at speeds far faster than a human drummer can. 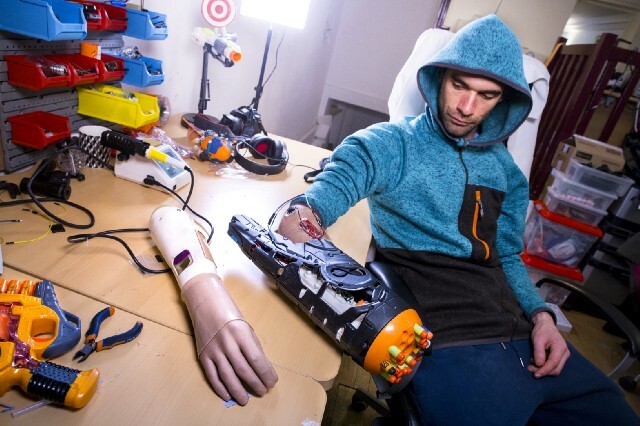 Maker collective Hackerloop modified a Nerf gun into a bionic prosthetic for their friend Nicolas Huchet. He fires the gun via EMG (electromyography) sensors that detect when he tenses his forearm muscles. 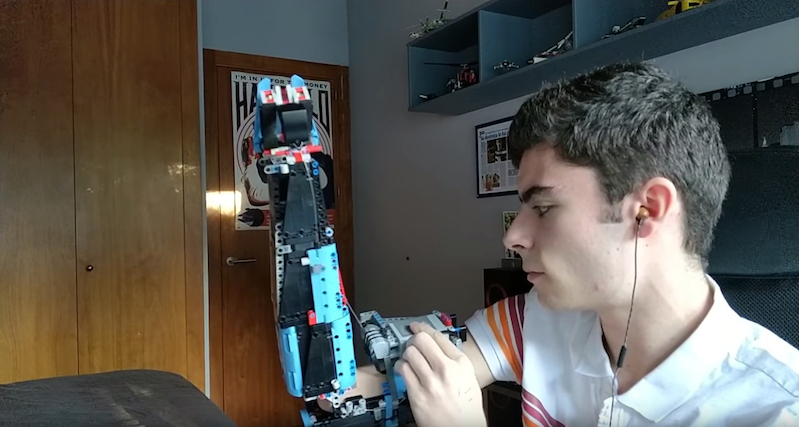 "It all started with jokes about the fact that it was too easy for us to win over him in a nerf battle, as he’s missing his right hand," writes "tinkerer in chief" Valentin Squirelo. 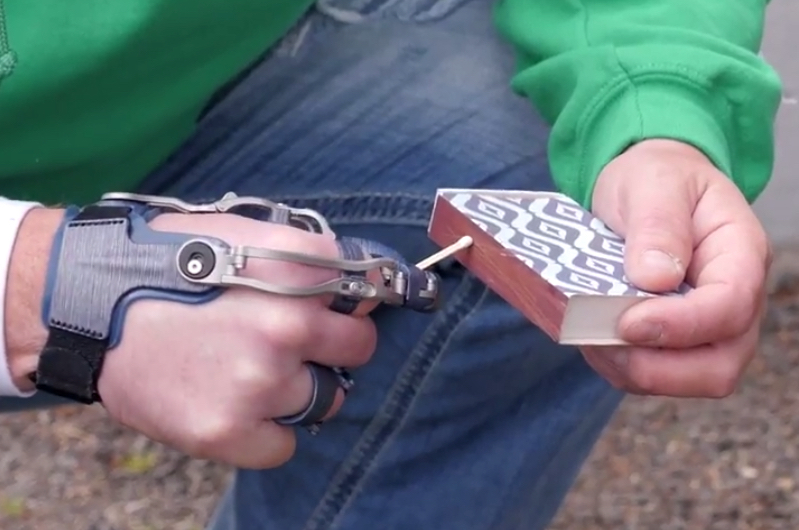 DIY hardware is not just about temperature sensors and automated door locks anymore. Every hardware component used to make this gun can be found online. “Electromyography is a great way to make the body communicate with hardware. We used it to detect electrical impulses and translated them into instructions for our gun. You could think of a thousand other uses. You could think it’s not the first problem to solve for people with disabilities, but in fact being able to have fun with your friends with these wonderful toys is also a real game changer”. 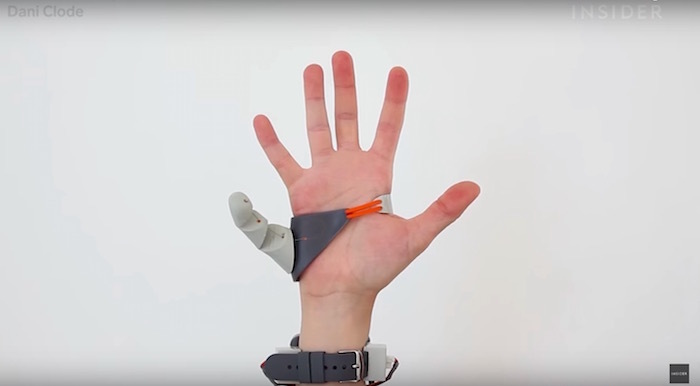 London product designer Dani Clode has created a prosthetic thumb, not to replace a missing digit, but simply to offer people an extra thumb, and therefore add to the human experience. She calls it the Third Thumb Project. Clode uses bluetooth controllers in her shoes, which are connected to pressure sensors underneath her toes, to manipulate the thumb. "It extends the wearer's ability. It extends the wearer's self. It's an addition to the body," she says in the video. "If only you could see what I've seen with your eyes." The surgeries are followed by a rehabilitation period, so that the patient can learn to contract the muscles in their upper arm by using their thoughts. If the patient imagines opening and closing their hand, the muscles in the upper arm contract. 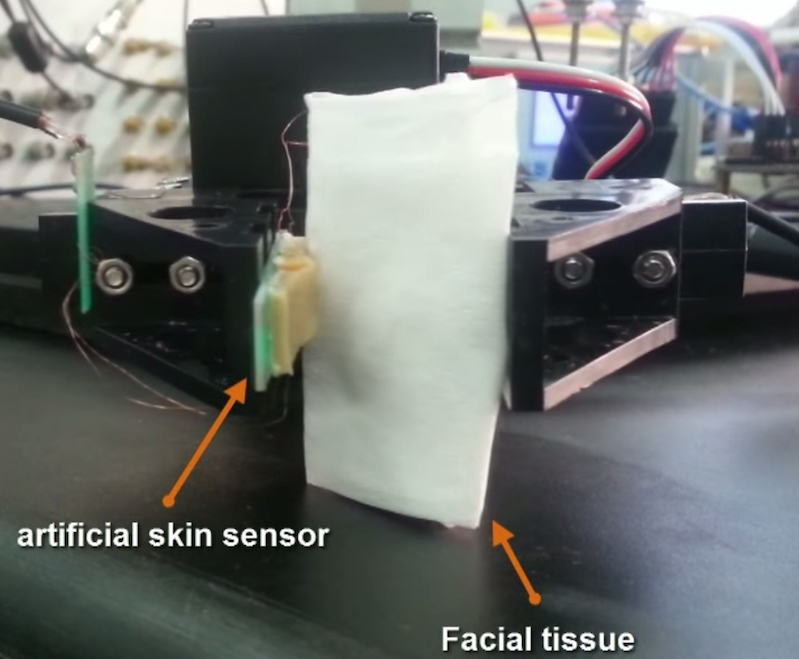 Are you ready for robots skinned with sensitive hairs? Lyon, France-based tattoo artist JC Sheitan Tenet has no right arm. In place of his right hand, he wears custom tattoo machine prostheses he developed with biomechanical sculptor Jean-Louis Gonzal. According to Great Big Story, "the device can pivot 360 degrees and allows Tenet to create abstract designs unlike anyone else." French designer Sascha Nordmeyer has commercialized her lip prosthesis art project and has made HyperLip available to selfie aficionados worldwide.